ABS-CBN proved to be the media network of choice for students at Polytechnic University of the Philippines (PUP), winning Television Station of the Year for ABS-CBN alongside AM Radio Station of the Year for DZMM Radyo Patrol 630, and FM Radio Station of the Year for MOR 101.9 at the 3rd Mabini Media Awards, which is voted on by more than 51,000 students across PUP campuses nationwide. 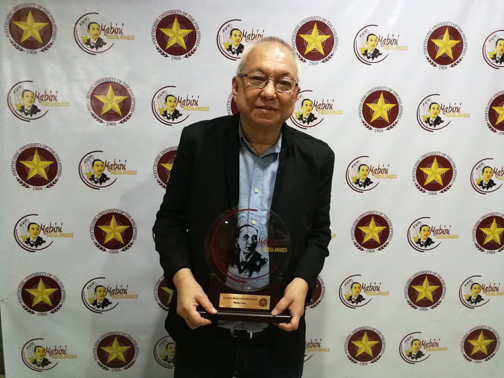 Ricky Lee receives the Apolinario Mabini Achievement Award from PUP's 3rd Mabini Media Awards. Aside from the three major awards, ABS-CBN also took home 16 other awards including Best Primetime Drama Program for FPJ’s Ang Probinsyano while Asintado won Best Daytime Drama Program. It’s Showtime won Best Variety/Musical Program while Gandang Gabi Vice won Best Talk Program. I Can See Your Voice won Best Game/Reality Program. In the news and current affairs category, Umagang Kay Ganda won Best Morning Program, Matanglawin won Best Educational Program, and Sports U won Best Sports Program, each for the third time running. Boy Abunda, who hosts The Bottomline, won Best Public Affairs Program Host. In the radio category, Radyo Patrol Balita Alas-Syete won Best News Program while Failon Ngayon sa DZMM won Best News Commentary Program. Host Ted Failon also won Best News Commentary Program Host. Heartbeats on MOR 101.9 won Best FM Radio Program while host DJ Chacha won Best Female Radio Jock. Meanwhile, ABS-CBN creative consultant and creative manager, and renowned screenwriter Ricky Lee won an Apolinario Mabini Achievement Award for his body of work in TV, film, and print, and It’s Showtime and Gandang-Gabi Vice host Vice Ganda won Online Personality of the Year. The PUP Mabini Media Awards is the largest students’ choice award-giving body that aims to give recognition to outstanding media practitioners, networks, programs, and radio stations that are exemplary models to communication students.